From working on the frontline of homelessness to contributing to the PAC session on the NAO’s homelessness report, former Chief Executive of Swale Borough Council, Abdool Kara, reflects on his first nine months as an Executive Leader at the NAO. 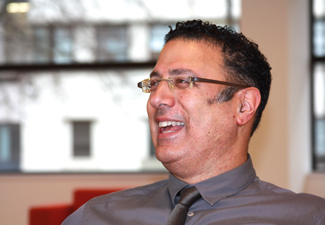 Abdool Kara joined the NAO in early 2017 as the Executive Leader responsible for the NAO’s value for money work in education, health, local government, and other local services, such as police and transport. Prior to joining the NAO Abdool had 25 years’ experience in the local government sector, including at the Audit Commission. Abdool also spent time at the Cabinet Office working on public service improvement. We asked Abdool to reflect on his role within the NAO and some of the highlights of his first nine months. Little did I expect when I joined the NAO in late February 2017 that I would have to wait until almost the end of November to attend my first Public Accounts Committee (PAC) meeting. As the NAO’s Executive Leader for Local Services, I support the NAO teams covering the work of Department for Communities and Local Government (DCLG), Department of Health (DH), and Department for Education (DfE). Between them, these teams produce around 18 value for money (VfM) reports a year, and six to eight investigations [for more, see our post NAO Investigates]. So the issue was not a lack of material. Rather, as the NAO only publishes when Parliament is sitting, the wait reflected the pre-election period and delay in forming a Government, followed by a back-log of NAO reports for the PAC to turn its attention to. As I began my local government career working in frontline homelessness, when I joined the NAO I was particularly pleased to see that it had started work on a study looking at the significant increase in homelessness in recent years. In my previous role as Chief Executive of Swale Borough Council I had witnessed first hand the rise in homeless applications, and the challenges in identifying both emergency and permanent housing for the families affected, not to mention the negative impact this had on the families themselves. Using this experience I was able to support the excellent NAO team to ensure that the final report [Homelessness] reflected reality on the ground. As a result, I was delighted to make this my first PAC session. 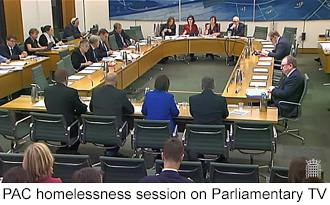 The PAC session on homelessness was held on Monday 27 November. Sir Amyas Morse, as the Comptroller and Auditor General, and Aileen Murphie, the lead director for the study, were the witnesses from the NAO side. Aileen set the scene for the Committee and it then heard from the independent witnesses it had called, from the Local Government Ombudsman, the charity Crisis, and two local authorities, Bristol and Hackney. Finally, the Committee then questioned the permanent secretaries and their supporting staff from the two key government departments involved, DCLG and the Department for Work and Pensions. Issues covered included the role of welfare reform in contributing to the rise in homelessness, the need for an increase in housing supply and the rising cost in many places of private renting. It also covered the need for DCLG, as the department responsible for the government’s homelessness policy, to develop a strategy for reducing homelessness that sets out clear targets and specific actions for all stakeholders, following a long period in which it had taken a more light touch approach. It was a long session, finishing well after 6 pm, but it was really pleasing to me to see just how much the Committee relied on the factual evidence set out in the NAO study – we pride ourselves on being evidence based after all. A learning point for me is that the PAC session is not the end point of the process. Following the session the Committee produces a report, including recommendations, to which the department(s) must respond, and these are captured in a Treasury Minute, which is then followed up over time. This approach provides real traction to ensure that changes are made that improve the value for money of public expenditure. The focus of my role is largely outward-facing with the key sectors for which I am responsible – health, local government, and education and skills. It’s about building relationships, informing the shape of our forward programme of VfM studies, and ensuring that the NAO is adding value through our work. One of the attractions for me in joining the NAO was the ability to look at issues on a sector-wide basis, and make recommendations that can help government programmes to have the greatest positive impact for service users and communities. Nonetheless, it is still my intention to attend as many PAC sessions as the diary permits, where they are related to studies produced by my various teams. I look forward to many more interesting and incisive such sessions in the months and years ahead. 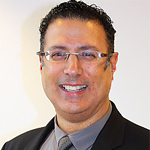 About the author: Abdool Kara joined the NAO as Executive Leader, Local Services, in February 2017. His previous roles including working for four different councils up to and including chief executive level, and seven years at the Audit Commission on both value for money and inspection. He also worked at the Cabinet Office on public service improvement. So, Abdool, has welfare ‘reform’ contributed to the rise in homelessness? If so, does the NAO have any standing: it’s a policy and all you can do is point out its (unintended?) consequences for spending decisions, including transferring spending between central and local budgets. Since the latter (imposing uncosted burdens on local government) has been going on for some time – as you can well testify — I wonder if DCLG is going to pay much attention to your pointing it out. Many thanks for your comment. You are right that we don’t comment on government policy decisions, but report on value for money of the implementation of the chosen policy. Our report, Homelessness, states clearly that the effects of welfare reform have contributed to the rise in homelessness. This isn’t just our view but an accepted fact that has been agreed with the Department for Work and Pensions. As to whether the Department for Communities and Local Government will pay attention, as noted in our latest Annual Report, 94% of our recommendations discussed with departments since April 2014 have been accepted. Furthermore, the Public Accounts Committee (PAC) will shortly produce its own report based on the evidence session to which my post refers, making recommendations to which departments must respond, specifying actions where they accept the recommendations (88% of PAC recommendations were accepted in 2016-17). We monitor and discuss regularly with departments their progress in implementing these recommendations. This is a significant motivation for departments to ‘pay attention’ to our recommendations.